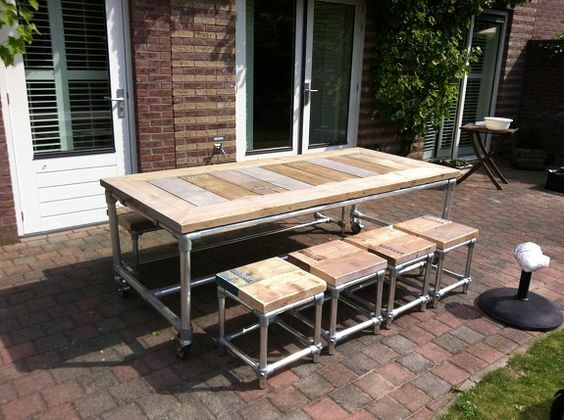 Looking to build your own DIY table but need a little inspiration first? 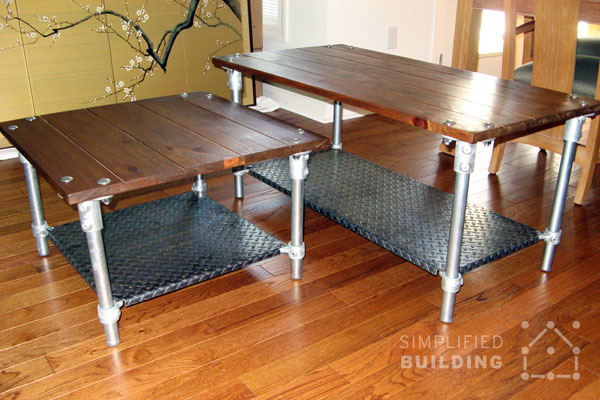 In this article, you will find 51 different DIY table ideas that are built using Kee Klamp fittings and pipe. 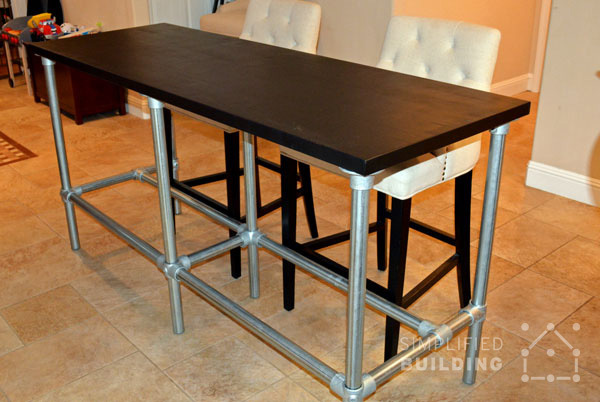 Using Kee Klamp allows you to create your own custom table frame without the hassle of traditional threaded pipe. Leaving more time to focus on the design, and the table top, rather than spending a bunch of time figuring how to put it all together. So browse the list below and draw inspiration from the creative ideas our customers have submitted to us throughout the years. If you see something you like, but aren't quite sure how or what you'll need to build it, feel free to reach out to our projects team for free design assistance. The above kitchen table features a Silestone quartz table top. 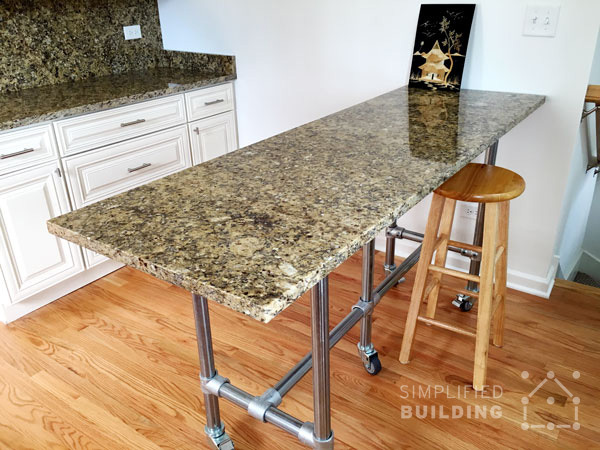 Although, not as heavy as granite, the large quartz top is still heavy enough to require a custom table frame design. The table frame utilizes an extra leg, at the middle of the frame, to provide support to the top. Horizontal bracing connects all five legs together to create one solid and sturdy base. This dining room table was built by Cole in Alfred Station, New York. 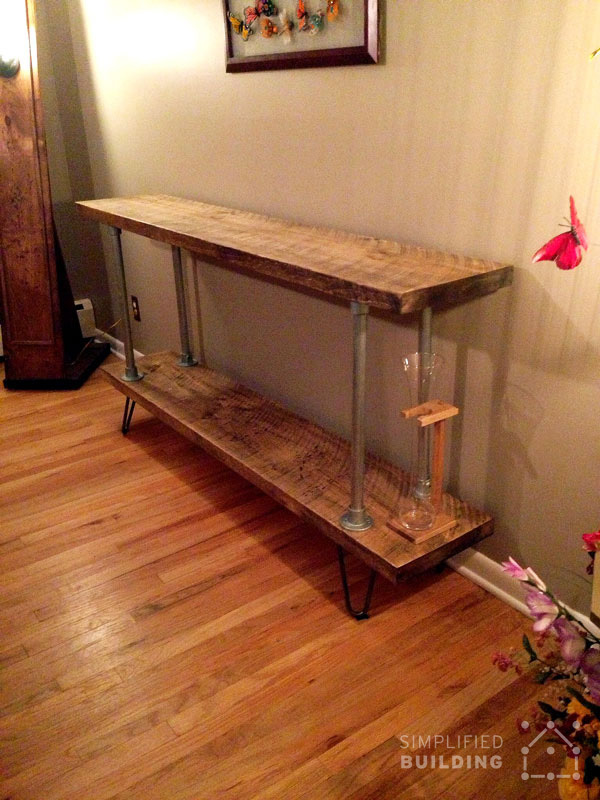 The table is 10 feet long and features a custom wood top to create the rustic element. 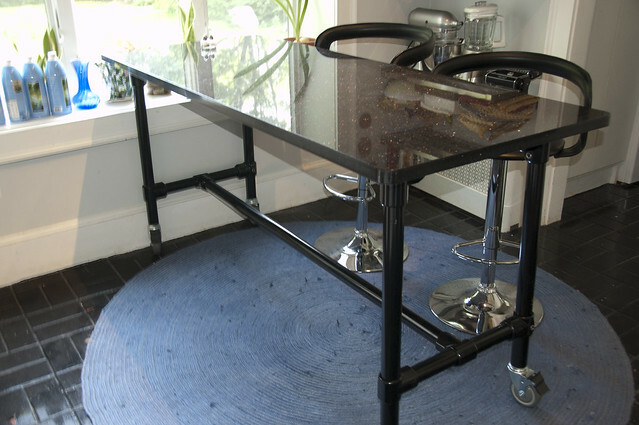 The table frame is constructed entirely with Kee Klamp fittings, making particular use of casters to allow the table to be easily moved when necessary. 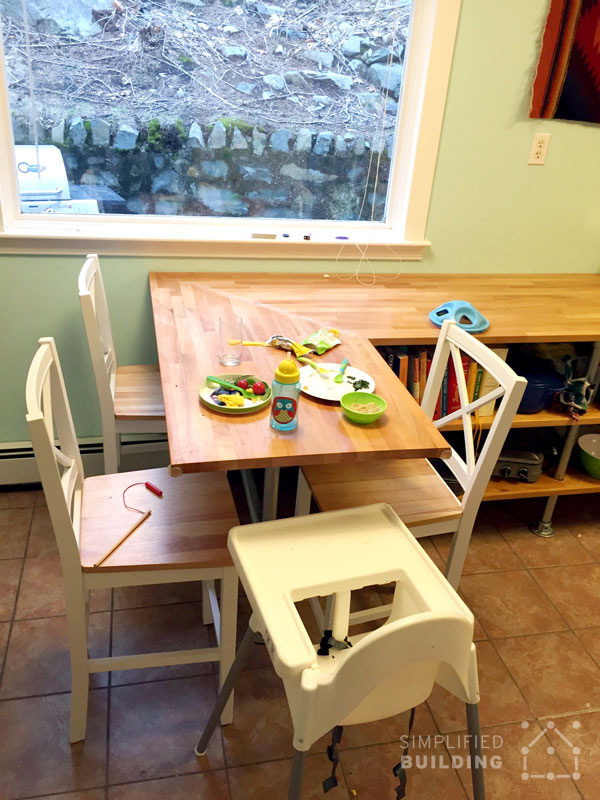 This kitchen table was built by Mike in Malden, Massachusetts. The table features an integrated shelving unit with three shelves (including the table top). The shelving can be seen at the right of the image. The table top and shelving were crafted from four Ikea hardwood counter tops. 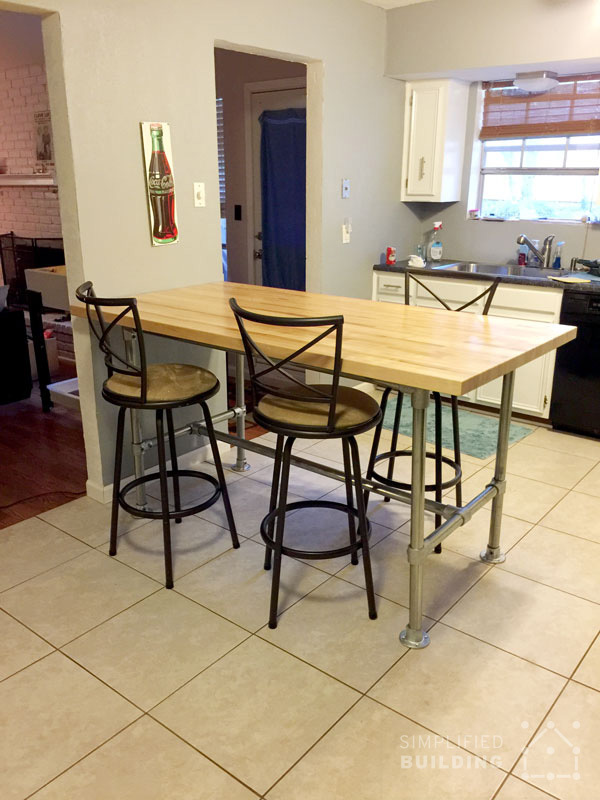 This kitchen table was built by Jeny in Arlington, Texas. The table features a butcher block table top and sits at bar height. 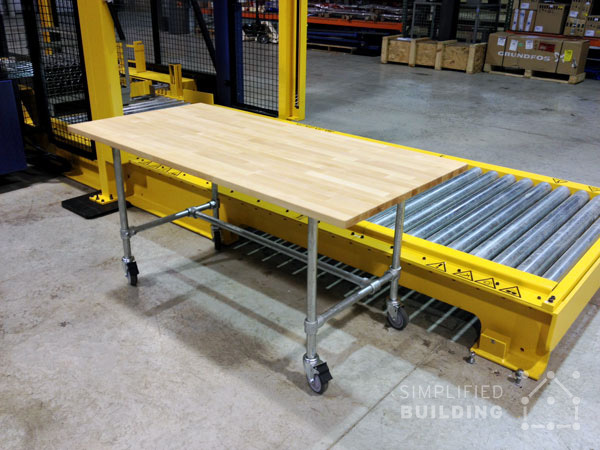 Jeny utilized our Rugged Table Frame Kit to make the building process even easier. "I used the Kee Klamps to stabilize a commercial kitchen prep table. This table originally came with a shelf and was not useful to sit around. Removing the shelf and re-configuring with Kee Klamps, we can now sit around the table and the table is very stable." The above table was built by Paul in Montreal, Canada. The table features a custom top that can be extended by adding an additional leaf. Paul appreciated the simplicity of Kee Klamp and took full advantage of our free design assistance to come up with a concept that fit his requirements perfectly. 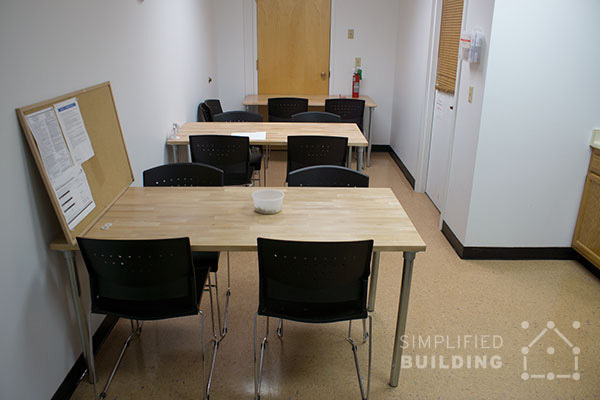 These simple tables find their home here in the Simplified Building office kitchen. The tables feature a butcher block top from Ikea that is 61" long by 29 1/2" wide. 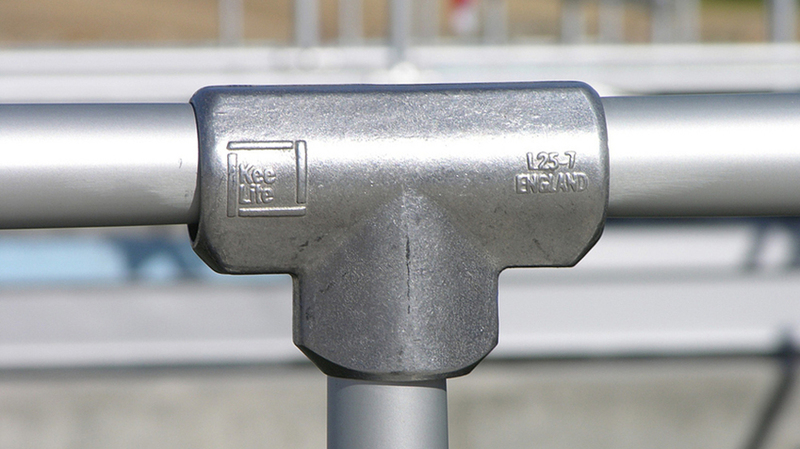 The simple design uses four legs assembled using the Flange fitting, pipe, and a Plastic Plug to cap off the exposed end of pipe. 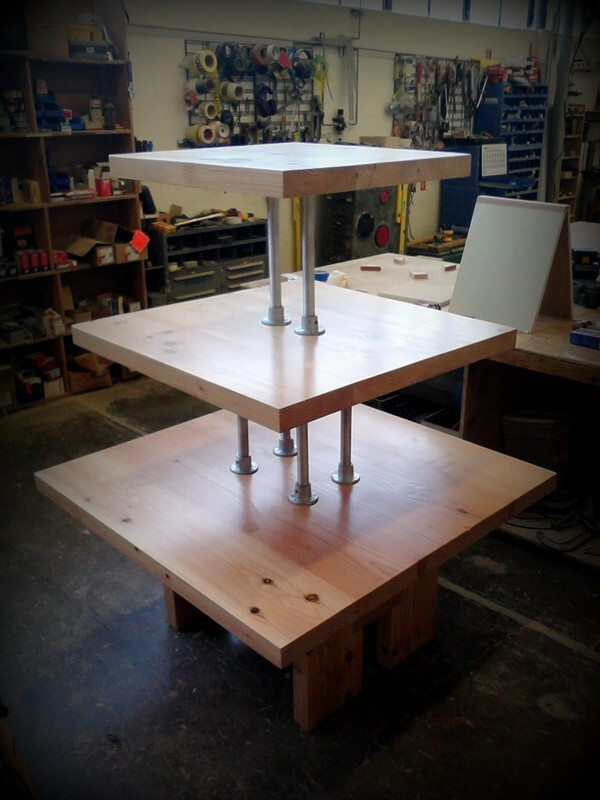 This simple table was built by Steven in Pleasanton, California. Steven needed something that would fit nicely in a small kitchen but wouldn't take up too much space. The resulting table sits at bar height and features an added horizontal brace, at the bottom of the table frame, to rest your feet when sitting. The above kitchen tables were built by Ryan in Hopkins, Michigan. The two separate, maple top tables come together to create one long dining table. A great idea that gives Ryan added flexibility. Ryan could even take the legs off one of the tables in order to store the table away in a deep closet, basement, or garage. Then simply bring it out and reattach the legs when guests come over. Leo built this kitchen table to fit four to six people. The table top and bench seating both feature tops built from a reclaimed section of a bowling alley lane. The table frame features extra bracing to provide enough strength to support the heavy tops. 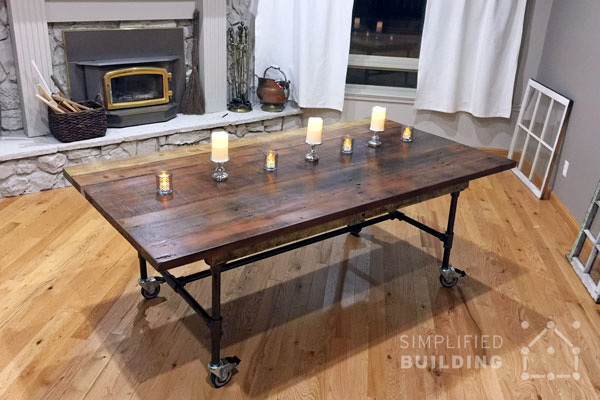 This rustic dining table was built by Mary in Scotts Valley, California. The table features a custom top built from reclaimed boards and the frame was painted black to match the rustic aesthetic. The table legs utilize casters allowing the table to be easily moved when necessary. 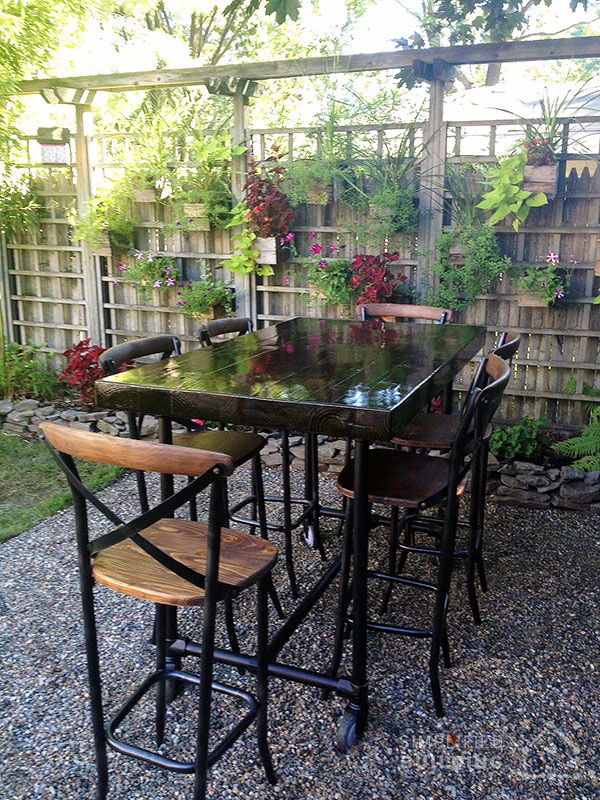 This kitchen table was built by Loren in Tacoma, Washington. The table sits at bar height and features casters on the bottom of the table to make it easy to move. 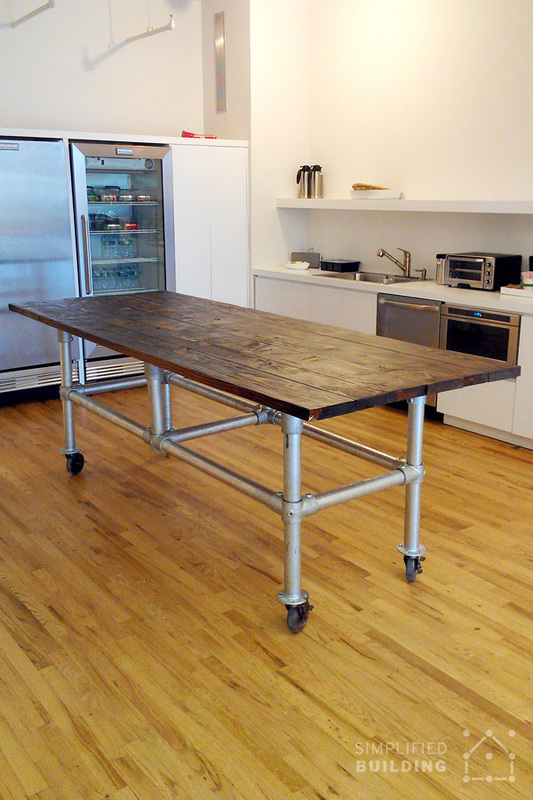 This rolling kitchen table was built by Michael in Albertson, New York. 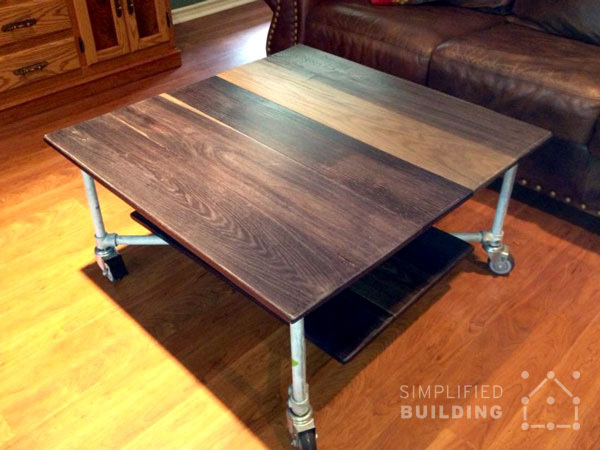 It features a custom table top to create a rustic appeal and casters on the bottom of the table legs, allowing the table to easily be moved when necessary. 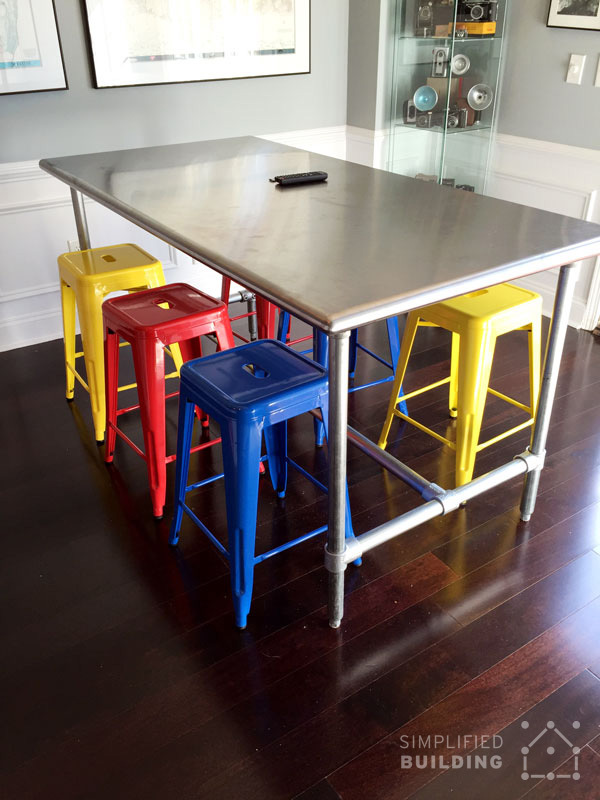 This rolling kitchen island was built by Ben for his son's new condo as a student at LSU. Space inside the condo is limited, so Ben wanted to create something that could be rolled out of the way when needed. The table features a custom-built top crafted from a 700 year old Sinker Cypress tree and makes of our Basic Table Kit. 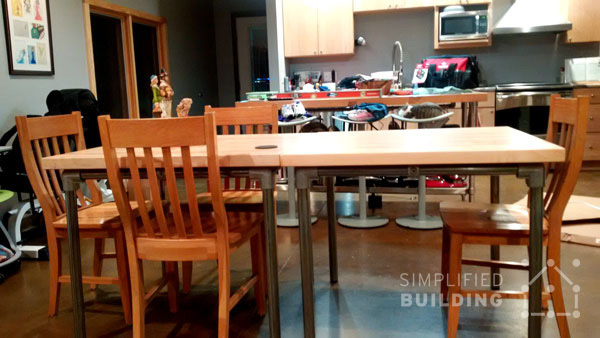 The above kitchen table was built by Jim for his home in Chicago, Illinois. The table features a granite table top that matches the kitchen cabinet counter tops perfectly. Since the granite top weighs over 225 lbs, Jim added an extra leg (in the middle of the table frame) in order to support the weight. This table was built by Jerry in Massachusetts. The table doubles as kitchen island and sitting area when eating. It features a granite table top and a Kee Klamp built frame that has been painted black to match the top. 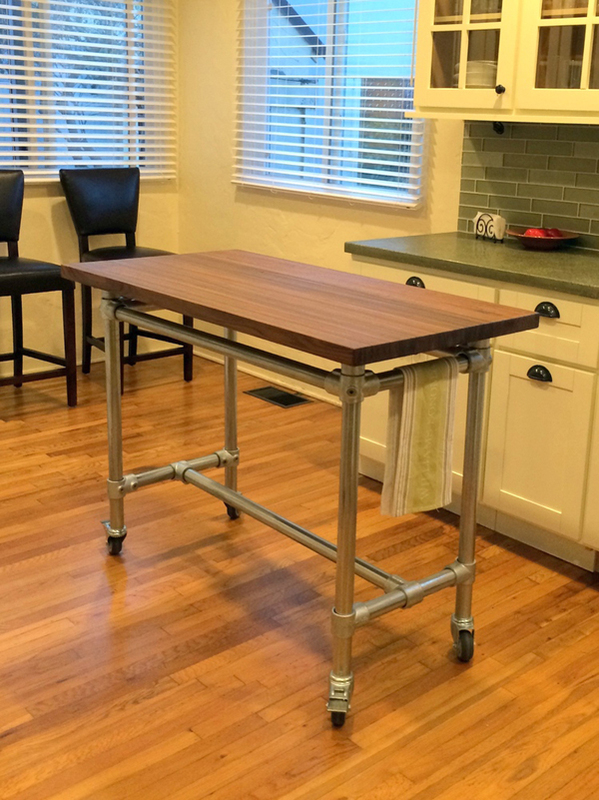 Justin, from Oklahoma City, built this kitchen island as a Valentine's Day gift for his wife. He had seen similar ideas in high-end design magazines for $3,000 to $5,000, which was way more than Justin wanted to spend. So he decided to built his own using Kee Klamp. The table features two butcher block tops, and all in all, Justin spent less than $500 on the entire project. This kitchen island was built by Margaret to give her kitchen some needed counter space. The table features a butcher block top that is 25" wide by 48" long. Margaret appreciates the versatility of the island, stating "The casters make moving it very easy, and it's simple to lock into place. I just love it". 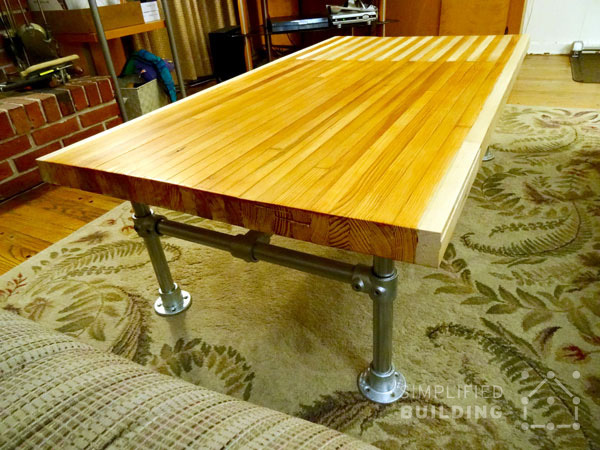 This coffee table was built by Leo in Glen Ellyn, Illinois. The table features a table top built from a reclaimed piece of bowling alley. Leo appreciated the quick assembly and adjustability of using Kee Klamp for the table frame. 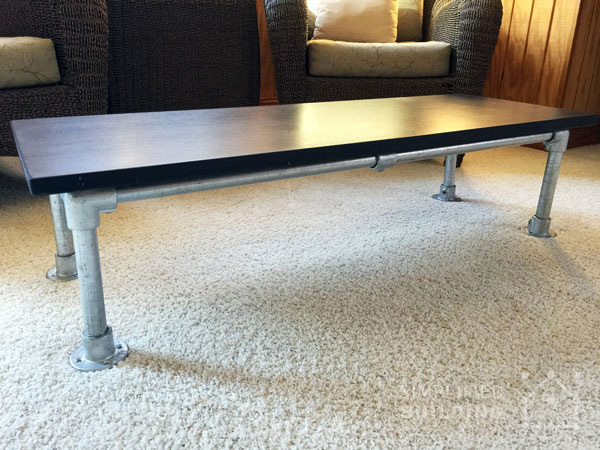 This simple coffee table was built by Bob in Shawnee, Kansas. The table features a slate table top that Bob has had for nearly 30 years now. The table complements the look of the contemporary home perfectly and Bob appreciated how quickly he was able to put it together. This DIY coffee table was built by Keren, one of our customers from Texas. The table frame fittings and pipe were treated with toilet bowl cleaner in order to "age" the metal and give it a more distressed look. The process worked well and pairs great with the dark, rustic table top. 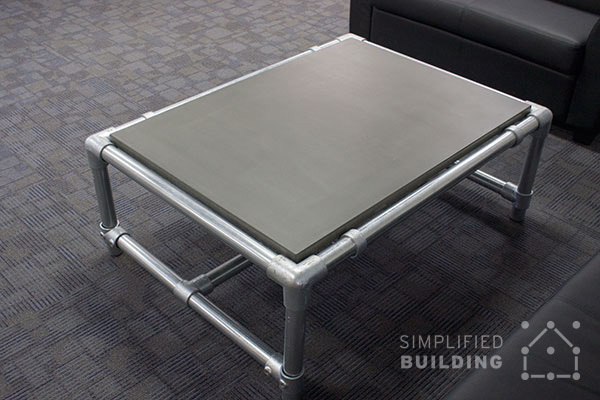 Another table featured in the Simplified Building office, this coffee table features a custom-built concrete table top. The top sits down in between the pipe frame. This is made possible using the M50 fitting, which creates the recessed look and attaches the top to the frame. 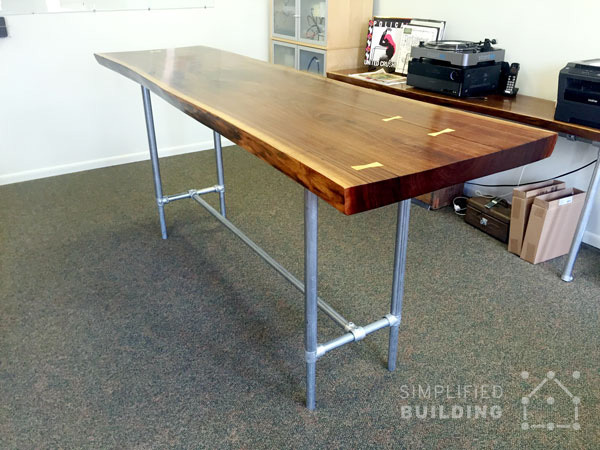 Read more about this table, and the rest of the tables in the Simplified Building office, in: "Table Frames for Any Table Top"
These two tables were built by John for his home in Flat Rock, North Carolina. One is a coffee table and the other, an end table. 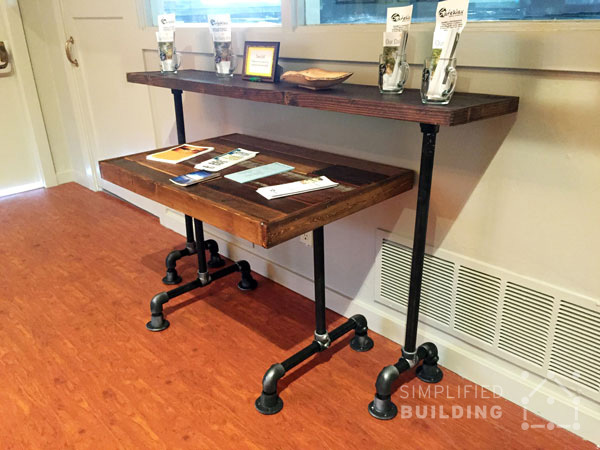 Both feature a rustic table top and a bottom shelf that is attached to the table frame using the M50 fitting. The above console table was built by Bob in Morristown, New Jersey. 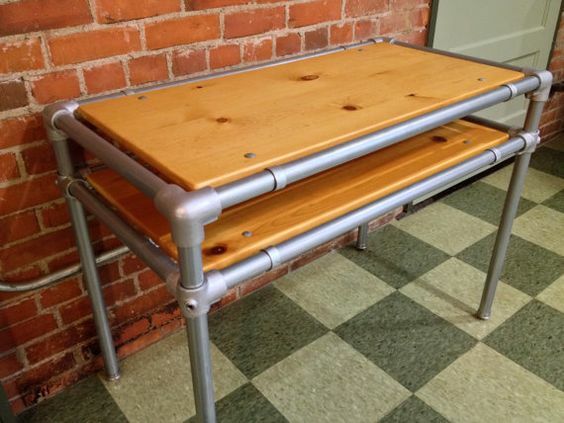 The table features a rustic design and utilizes four lengths of pipe, mounted to the boards using the Flange fitting, in order to create the different levels. Bob also used 8" hairpins legs at the bottom of the table to create separation and achieve a more unique look. This small console table features a unique design that places the wood tops recessed in between the pipe frame. This is made possible with the M50 fitting which creates the desired look and attaches the boards to the frame. The P50 fitting could allow be used. 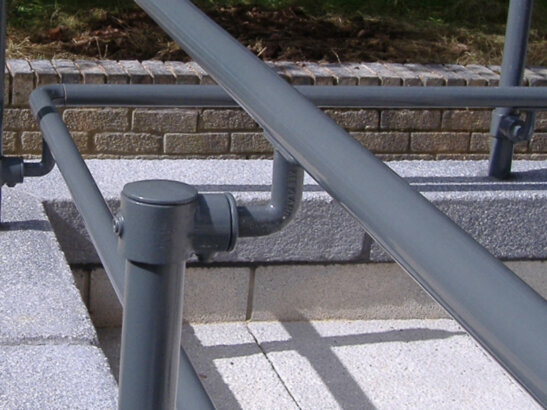 This fitting would place the boards even lower and more recessed between the pipe outer frame. 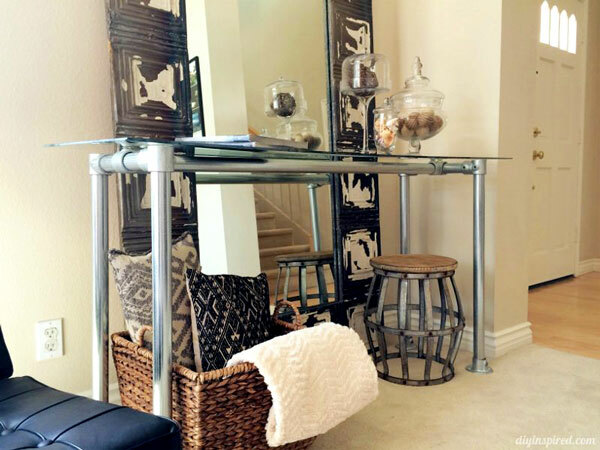 This console table was created by Dinah over at DIY Inspired. Her unique take uses one of our Simple Table Kits flipped upside down to create the look. The glass table top simply rests on top of the frame and other accessories (like wood shutters, a large mirror, small stool, and other decor) work well to complement the look. She did an entire write up on the project, which you can read here. This outdoor patio table sports a sophisticated look that features a dark brown table top with a high-gloss finish. The table frame features casters on one side, that allow the table to be lifted from the other, and then moved when needed. This approach keeps the table from rolling away. However, if you use our casters, you could simply add them to all four legs and lock the wheels in place, to keep the table from rolling. This table was built by Andy for the patio area in his backyard. 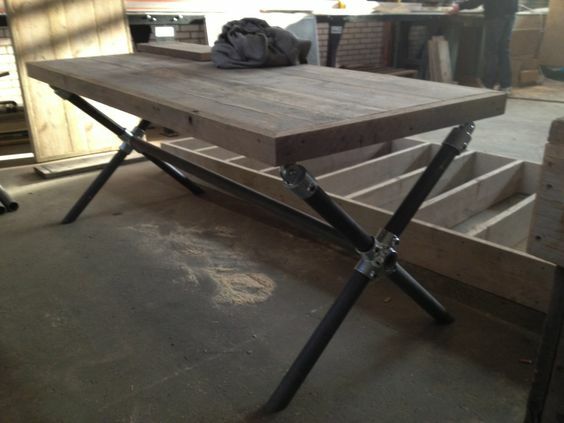 The table features a custom table top built from reclaimed boardwalk wood planks. 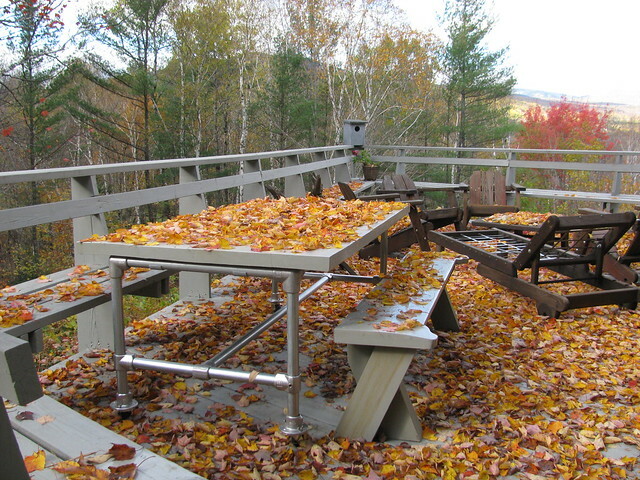 The table sits at bar height and utilizes casters to allow the table to be rolled when necessary. 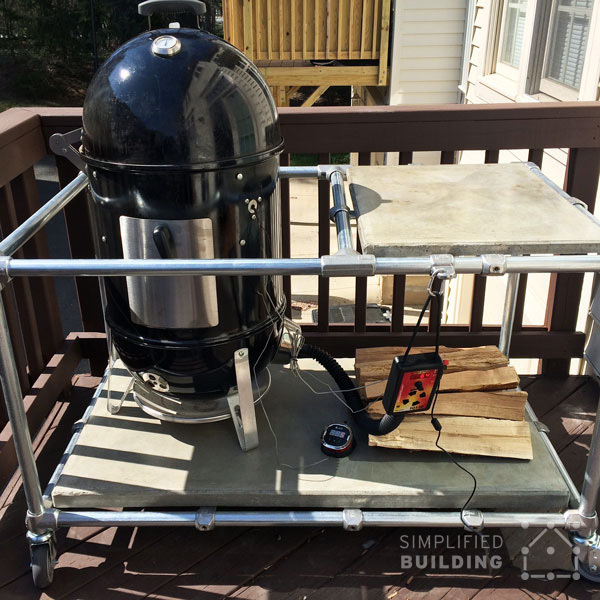 "I built this outdoor BBQ table after reading your blog. I've been looking at designs for some time. I originally wanted a steel structure as opposed to wood, but didn't want to weld pieces together. Once I discovered similar tables made from Kee Klamp fittings and concrete table tops on your blog, I decided on this design. The Kee Klamp fittings were easy to assemble, so I could focus on creating the concrete table tops." This table was built by Paul in Salem, South Carolina. The table features a custom white oak top and uses hickory wood dowels for the table legs (rather than typical steel pipe). It also features casters on the bottom of the tables legs for easy mobility. 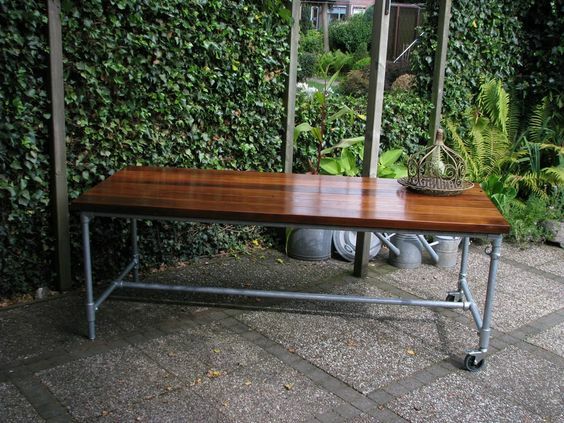 This large patio table features a custom-built table top from reclaimed boards. 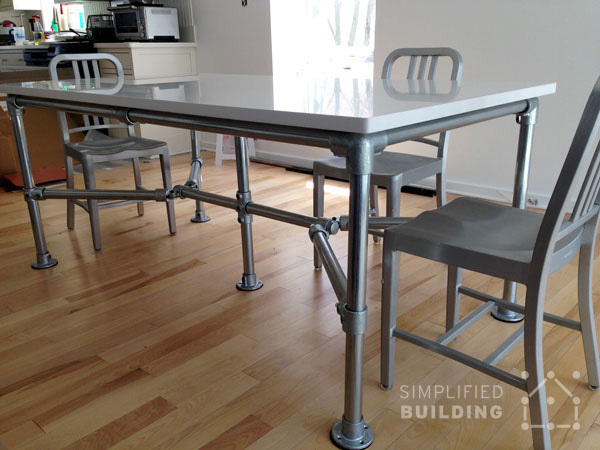 The table frame, as well as the stools, are both built from Kee Klamp fittings and pipe. The table frame offers a rugged, yet functional design, by making use of casters which allow the table to easily be moved when necessary. This outdoor patio table, features a custom-built top crafted from reclaimed wood boards. 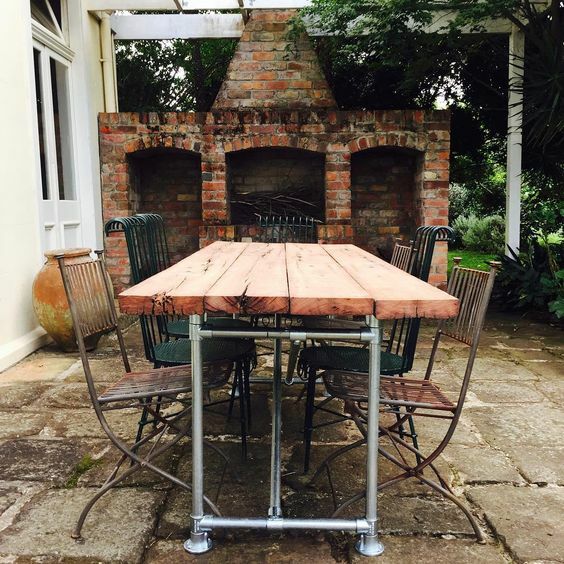 The frame is built entirely from Kee Klamp fittings and pipe, making use of the Flange fitting to support the top and as a foot for the table legs. 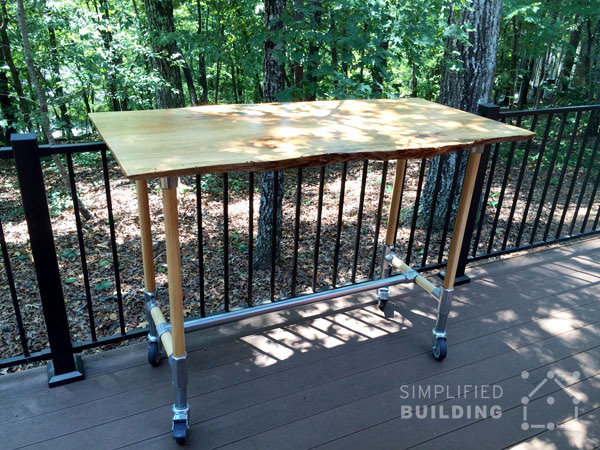 This rolling outdoor table was built by one of our customers to sit on their large back deck. The table features a custom top that is 2" thick and uses metal strappings, attached to the underside of the top, in order to keep it from warping. They then used Cabot's Decking Stain for the top and bench seating. 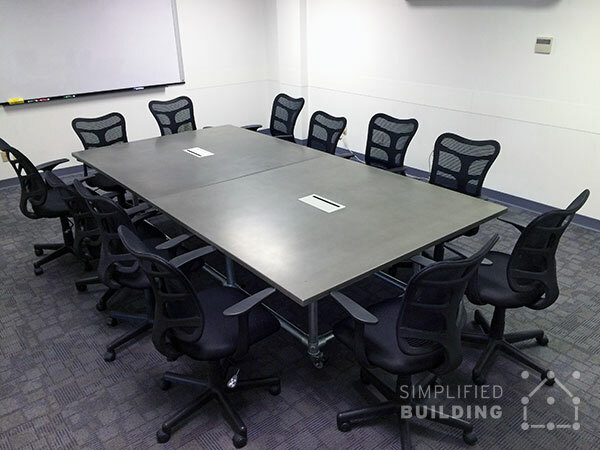 The above conference table was built by Andrew for his architecture firm in San Marcos, Texas. The table features a custom top constructed from concrete formwork plywood (also known as "chudoboard"). The table top is 42" wide by 96" long. 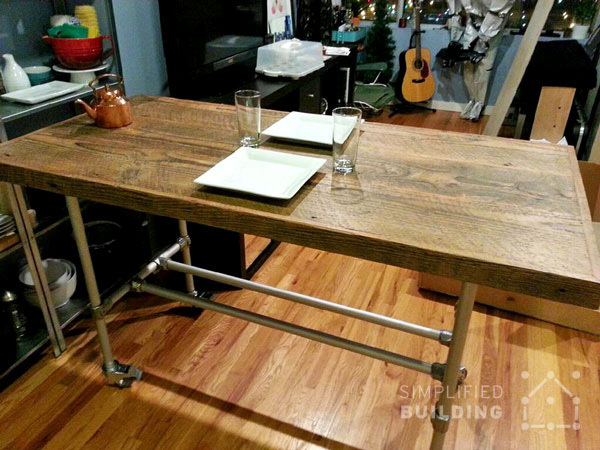 Ben wanted to create a table for his office that was unique and featured an industrial look. 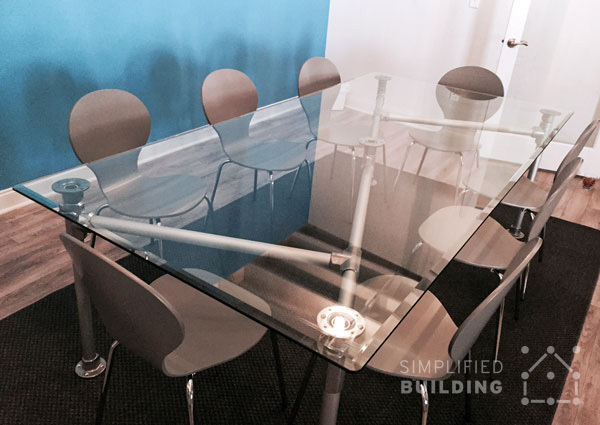 The result is the above conference table that features a glass top and utilizes our Z-Frame Table Kit. Ben appreciated the ease and simplicity of going with the kit solution. 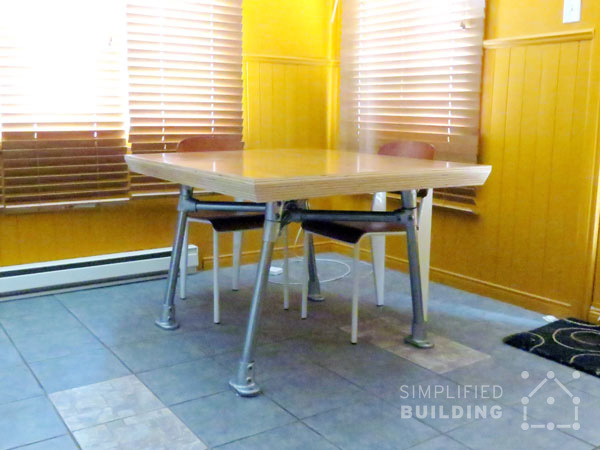 See this idea and more like it in: "5 Modern Conference Table Ideas"
This conference table was built by Dennis in Parsippany, New Jersey. The table features a glass table top rested on one of our Z-Frame Table Kits. Dennis spray painted the frame blue and used numbered coasters in between the Flange fittings and glass top. 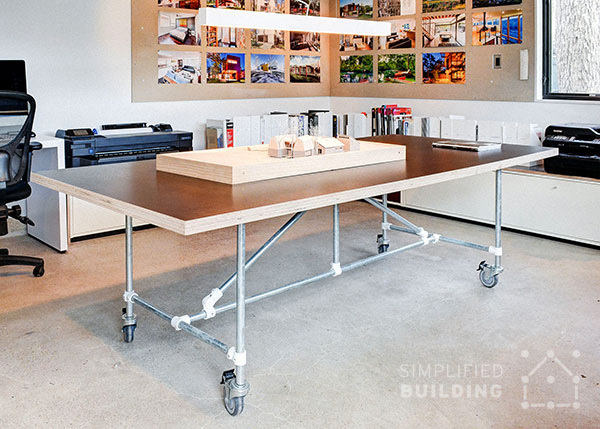 The above conference table is featured right in our own office here at Simplified Building. 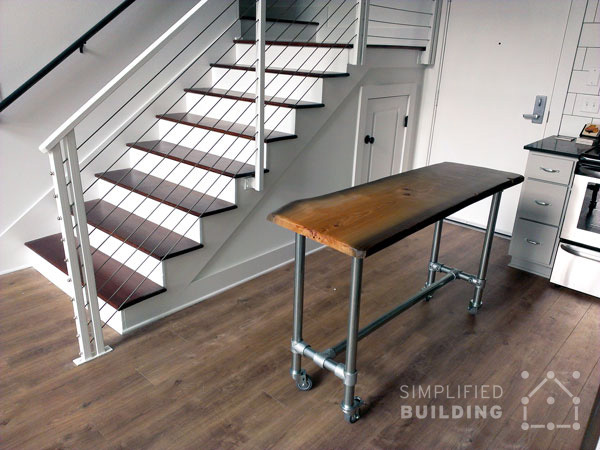 Having helped so many customers build with Kee Klamp throughout the years, we decided to outfit our entire office with Kee Klamp built furniture, one of which being this table that features a custom-built concrete top. 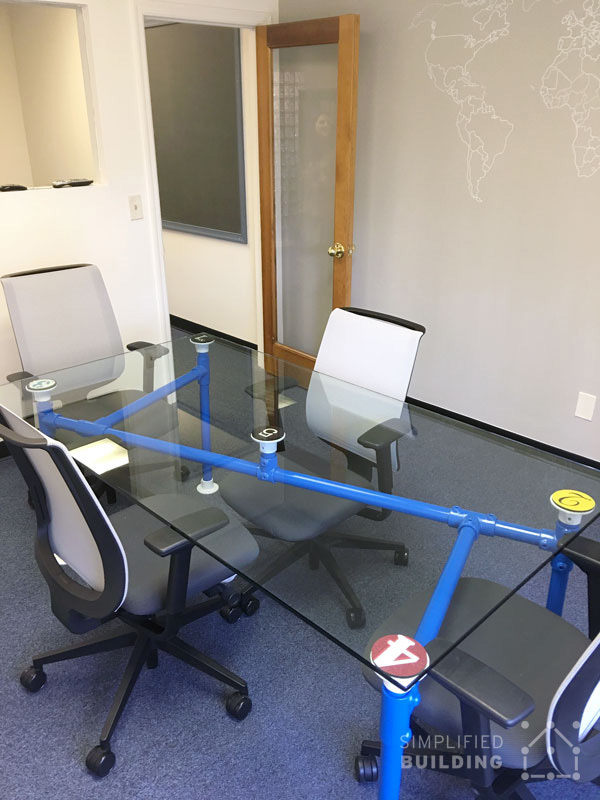 Read all about this conference table and the other tables in our office in: "Table Frames for Any Table Top"
This table was built by Kyle after he was given the task of finding a conference table for his company's office. After some searching on the internet, however, Kyle decided to go the custom route and build something himself. The result is this fantastic conference table that features a glass top and sports an x-frame design, which is made possible using the Four Socket Cross fitting. 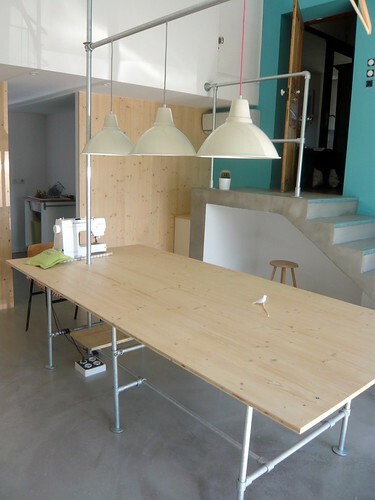 This large table was built by a french couple as a workspace in their newly transformed garage. The couple redesigned their entire garage into a fully-functioning studio outfitted the Kee Klamp built table, lighting fixture, and stair railing. 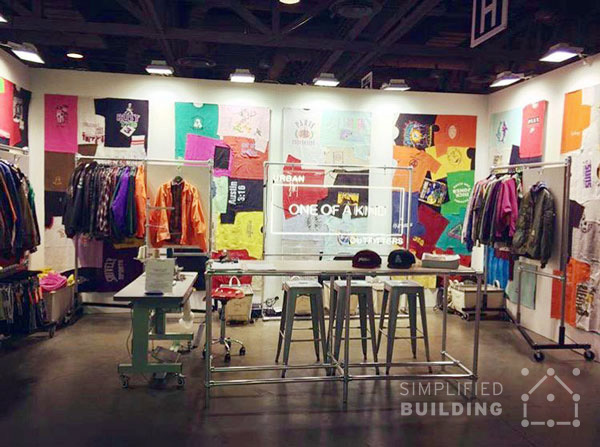 The above table was built Brian in Huntington, California for a trade show convention. Brian wanted something he could put together without the use of power tools. Kee Klamp allowed for a perfect solution enabling Brian to assemble the table frame using just an Allen wrench. 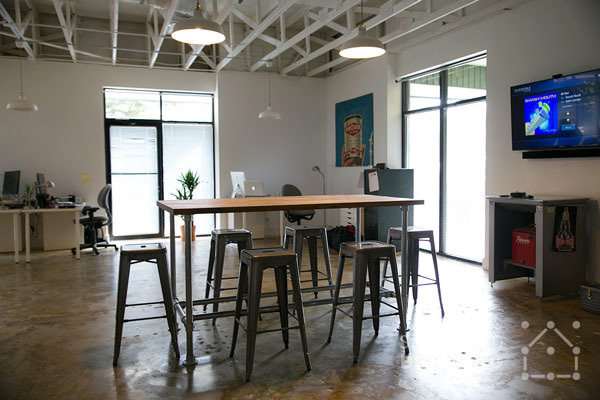 The above table was built by Gene for his creative agency's office in Marietta, Georgia. The table functions as a place for meetings and just hanging out. Gene utilized our Basic Table Kit to make the assembly process even easier. "The kit format made it very appealing. It was great being able to simply enter our top measurements and the site take it from there", said Gene. 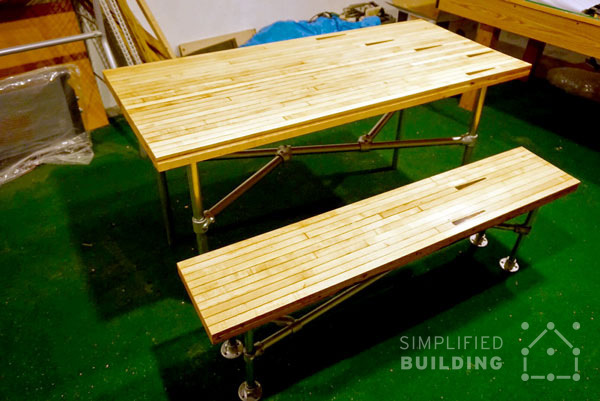 These dining tables were built by Troy for his startup in San Francisco, California. 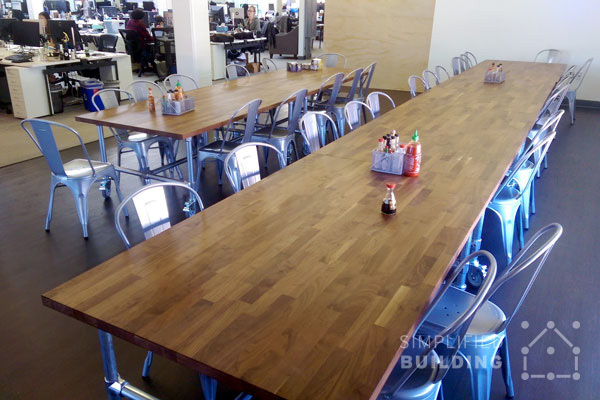 There are 12 tables total, allowing the company to place them next to each other, in order to create one long surface (as seen above). 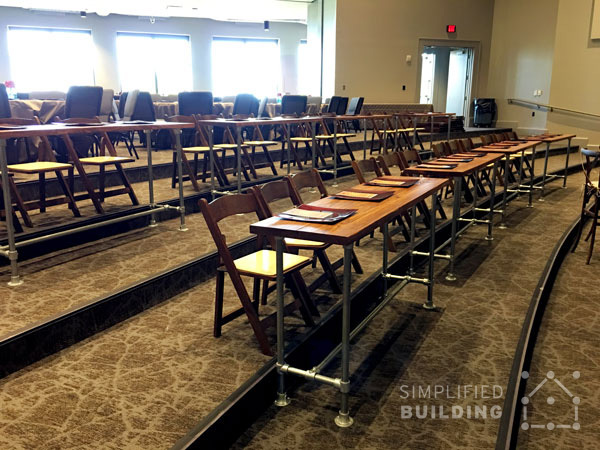 Troy appreciates the industrial look and that the tables can be easily moved out of the way for cleaning and company events. 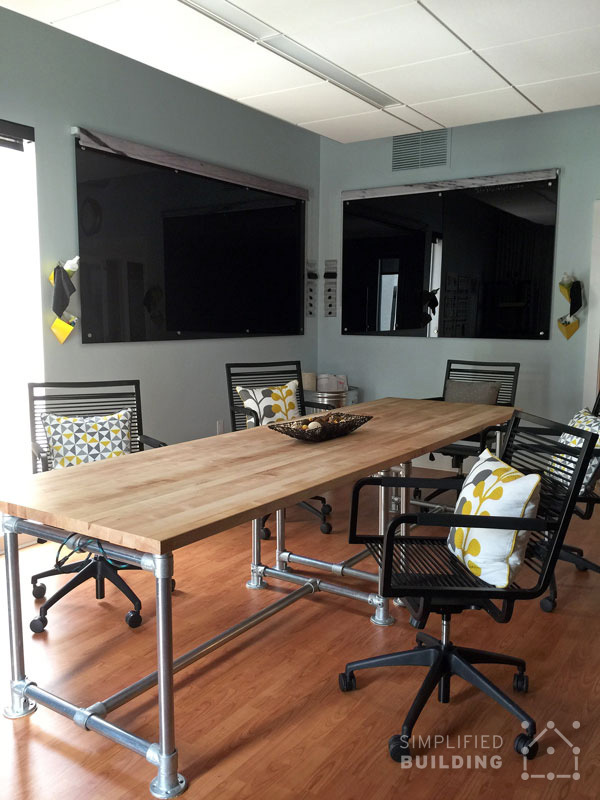 The above table was built by Josh for his creative agency's office. The table features a black walnut, live edge table top. While the desk is positioned at standing height, since Josh used our Adjustable Height Table Kit, the table can also be positioned to sitting height. Josh appreciated the custom design and cost efficiency of using Kee Klamp for the table frame. 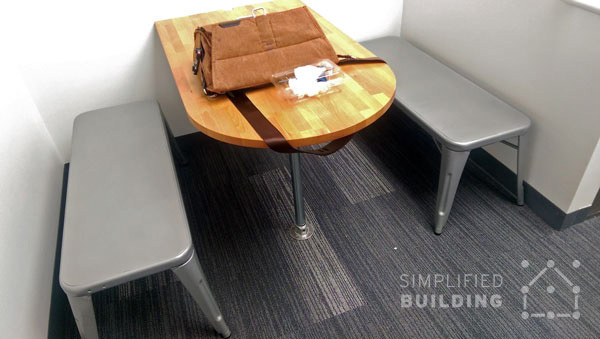 This simple table was built by Jason for a collaboration space in his company's office. The table is one of four featured in the space. It uses a simple design that utilizes just one length of pipe to support the table top. Jason appreciated the ease of use and style of Kee Klamp for the project. 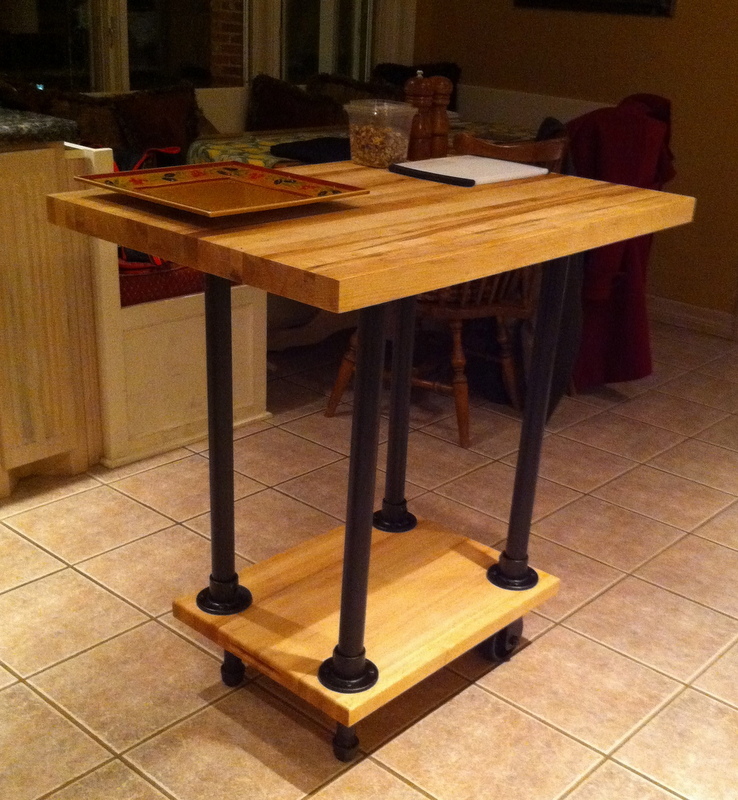 This rolling work table was built by Richard in Caledonia, Michigan. 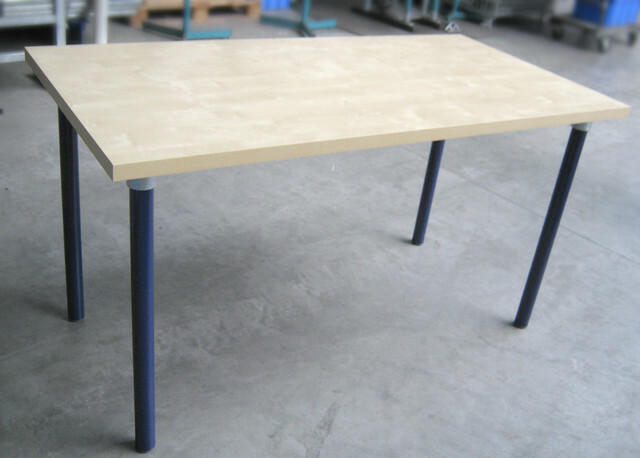 The table is used in a warehouse facility as a preparation workstation for a production machine. The table utilizes our Basic Table Kit and utilizes casters on the bottom of the table legs for easy mobility. The above set of tables were built by Drew for a multi-level staircase in his new church facility. There are 14 tables total standing at a height of 34" (26" from the top step to the table top). Drew appreciated the ease of use and flexibility of using Kee Klamp to build the tables. "Once I learned of the Allen wrench style fittings, that made this project excitingly possible. I can't imagine trying to line up this project with threaded things. Everything is easily adjustable for future changes or leveling." 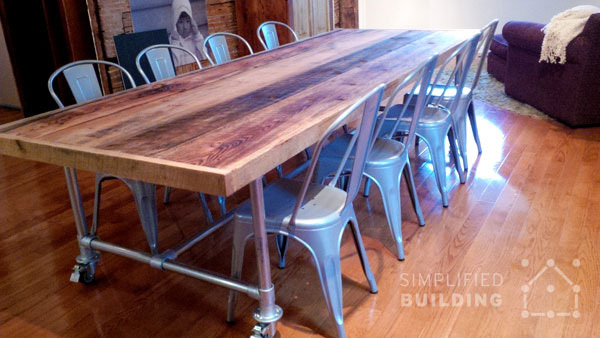 This table features a custom-built table top crafted from reclaimed boards and an x-frame design for the table base. 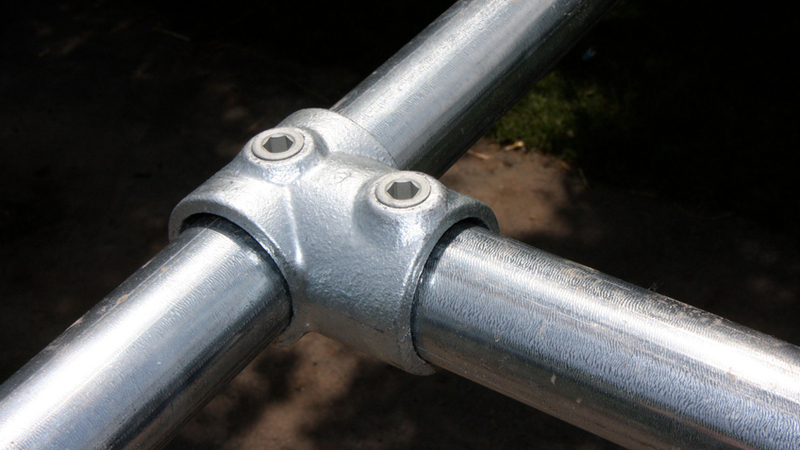 The x-frame is created using the Four Socket Cross and Swivel Flange fittings. This table was built by Gabe for his book store in Portland, Oregon. The table features a three-tiered design that is made possible using pipe with a Flange fitting on each side. The table tops themselves were crafted from reclaimed fir beams. This table sports a simple design that is built from just four legs and an Ikea table top. The legs are built using the Flange fitting, pipe, and a Plastic Plug to cap off the exposed end of pipe. Hopefully, after browsing this massive list of DIY table ideas, you were able to find one that sparks your imagination and motivates you to build your own! If you saw an idea, but aren't quite sure how to build it or where to start, remember we're here to help. Feel free to reach out to projects team via email (projects@simplifiedbuilding.com) or by visiting our free design assistance page. Finally, for a simpler solution, we do offer a few table kits. Take a look and see there is one that works for your application. Did you enjoy this article? Let us know in the comments below what you thought of the ideas in this post and be sure to sign up to our email newsletter to receive updates on future projects like this one.